A Georgia Chick-fil-A made a difficult time for a young girl just a little bit easier, and her mother is calling her local restaurant "the hands and feet of Jesus." The girl, just 17 months old when her father died, is now 6. 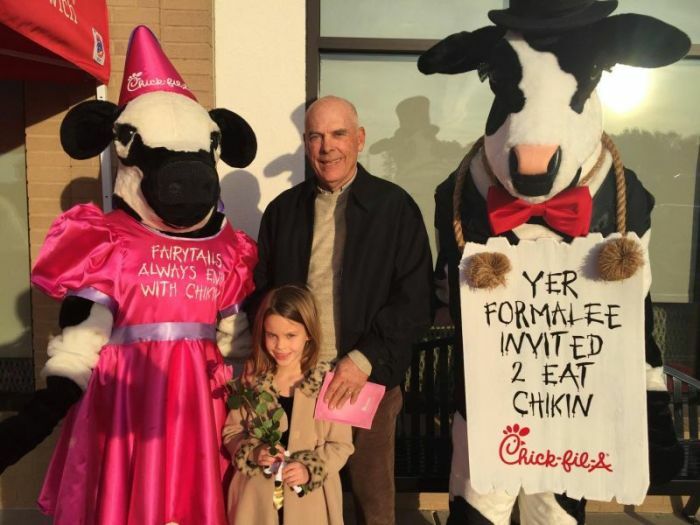 Her mother, Katherine Butler, said that she typically avoided "Daddy Daughter" events, but when Butler's local Chick-fil-A in Line Creek hosted their "Daddy Daughter Date Night" last week, her young daughter said that she wanted to go, reported FOX5Atlanta. "Now that she's 6 this year, for the first time she said she wanted to go, and she wanted her granddad to take her. With tears in my eyes, I made the reservations," said Butler. Hoping to make the day a little more special for her daughter, the woman reached out to the restaurant's general manager, Alan Murray, and he obliged her requests. But what came next, caught Butler off guard. Although she had purchased a card for her father, and ordered a corsage and boutonniere to be delivered, the couple received something extra special. "My Dad said that they were greeted by name as soon as they got out of the car, and handed not only the card that I had dropped off at CFA [Chick-fil-A] the day before, but the sweetest bouquet of pink Tulips I've ever seen." Butler was so thankful, that she took to Facebook to express her appreciation. "Five stars just isn't enough for how I feel about Chick-Fil-A as a whole, and especially for how I feel about our local Line Creek CFA and it's wonderful staff and management," she wrote. "Last night they had their Daddy Daughter Date Night, which is a sweet event in and of itself ... Most years we just ignore all of the Daddy Daughter events that pop up in February." "They made my daughter feel so special, and so loved last night. Thank you Mr. Murray and the rest of Line Creek CFA for truly being the hands and feet of Jesus, not only to my daughter, last night, but to our community, six days a week."